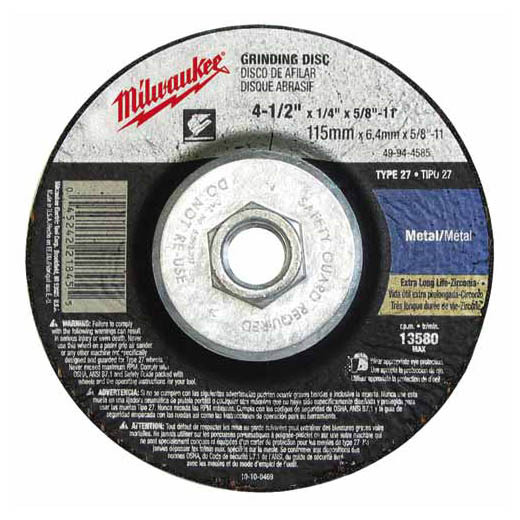 Milwaukee's comprehensive offering of grinding and cutting wheels consists of 45 unique products ranging in diameters from 4-1/2 in. to 14 in., with arbor configurations of 7/8 in., 20mm, 1 in. and 5/8 in.-11. Milwaukee's abrasive offering is manufactured using three types of abrasive grains, Aluminum Oxide, Silicon Carbide, and Zirconia Alumina, providing products for general purpose to specialized high performance applications.